Every year, Shark Week gives us a peek into the world of shark research and the amazing science and technology developing to study these captivating animals. This year, we were amazed by ultrasounds for pregnant hammerhead sharks and measuring a goblin shark’s bite. The latest science and technology can also help fishermen seeking other species to avoid sharks, protecting them from a significant source of injury and death while saving fishermen money. 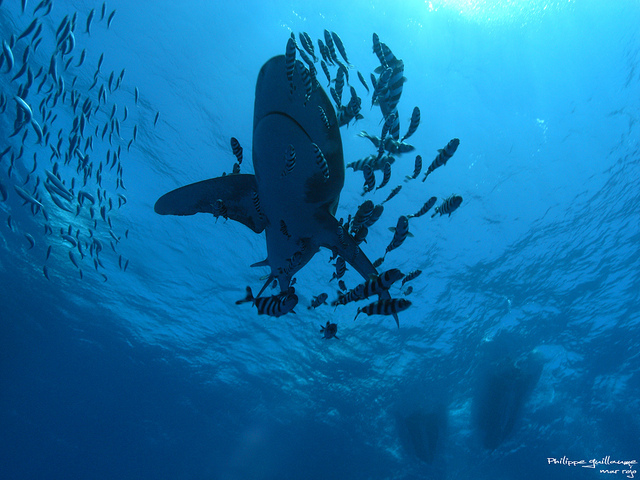 Globally, shark bycatch represents one of the greatest threats – maybe the greatest threat, — to shark populations. Worldwide, sharks caught as bycatch can make up nearly half of the total reported catch, and that’s not counting the large amount of catch that goes unreported. Often, fishermen want to catch more valuable species like swordfish and tuna using pelagic longlines, one of the most prevalent fishing gears on the high seas, and hate accidentally catching sharks instead. So how can science and technology help solve this problem? On the West Coast, scientists are creating a new tool called EcoCast that will predict in near real-time where important highly migratory ocean species like swordfish, leatherback sea turtles and blue sharks are. Giving this high-resolution, timely information to fishermen will let them find more of their intended targets like swordfish, while avoiding non-target species including sharks, and will help regulators optimize management decisions to benefit the resources as well as the fishermen. In the U.S. Atlantic and Gulf longline fishery, such a tool to help fishermen plan fishing trips could improve the performance of the fishery both ecologically and economically. On the East Coast, a Nova Southeastern University researcher working with forward-thinking fishermen has proposed research that would use 100 percent electronic monitoring (on-board video cameras) to track every fish caught and use electronic logbooks to couple catch data with oceanographic information. If approved, analyzing these data could lead to the ability to predict what oceanic conditions correspond to which species and the development of a near real-time bycatch avoidance tool, allowing fishermen to maximize their target catch while protecting other species, such as sharks. By using these more precise tools rather than large closed areas that can span entire state coastlines, fishermen can catch more fish that are at healthy population sizes – like swordfish – and fewer sharks. One challenge with using on-board video monitoring is the cost and time it takes to review the footage. Private companies, NGOs and researchers are developing software to automate the review process, which would reduce costs. Mote Marine Laboratory is pioneering new approaches to camera configuration (placement and types of cameras and lenses) on bottom longlining vessels to capture good imagery of sharks, which can be hard to see on video and to identify at the species level. Cutting edge tools that predict where sharks will be could help fishermen to avoid them, which ultimately could help in the recovery of imperiled shark species like dusky, scalloped hammerhead, and oceanic whitetip sharks. These tools could be even more powerful when combined with increasing the flexibility for U.S. fishermen to fish when and where they want, as long as they stay within scientific limits. Such a management approach could also help U.S. fishermen catch more of our swordfish quota–they only caught a third of it last year largely due to lack of access to fishing grounds. Landing and selling more swordfish domestically could reduce U.S. reliance on imports, often from fisheries with far greater impacts on sharks and sea turtles, and decrease the overall seafood trade deficit. I’d love to see a special on these new technologies next year on Shark Week! This entry was posted in Domestic, Science/Research and tagged bycatch, science, Shark Week, sharks, technology. Bookmark the permalink. Both comments and trackbacks are currently closed.